While watching star wars on new years eve on their new blue-ray thingies, I noticed At the very end of Episode V, right after the falcon escapes Bespin there are several seemingly unique ships in a flyby scene that pans across the Medical frigate and its surrounding escorts. Watching that scene closely I realized I had NO IDEA WHATSOEVER, what most of those ships were! Now this is a pretty exciting moment for me, but then when I got home, and decided to try and start poking around to learn more about them, I realized I didn't have much of a place to start. I'm a huge fan of the movies, and have played a ton of the star wars games console/computer/board etc... but am not as familiar with the expanded universe. 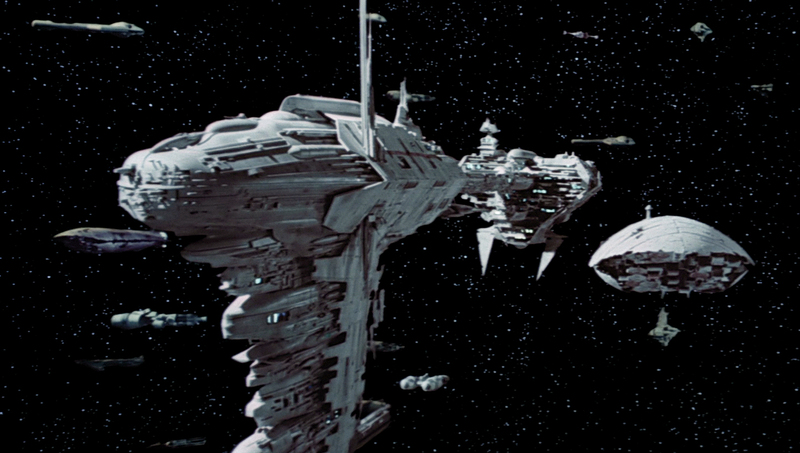 I'm pretty positive that aside from the stock transports/fighters/etc that we all know, none of these ships make an appearance in the battle of endor too, which makes them even more interesting to me, since the Rebel alliance seemed to be throwing most everything it could put together for that fight. I can't imagine something seen directly in the movies doesn't have a pile of lore to go with it, (especially a starship since there's only a handful of them seen in each movie), so I'm just hoping for a little help in finding out just whats in that motley assortment of ships the rebels managed to assemble there. EDIT: since its a flyby, watching the scene actually gives you a Front to Side on a lot of them, due to the perspective change. so if they're too blurry in the stills I linked you may be able to tell just by watching it in slow-mo. Also, a lot of them also look like kitbash combinations of ships too. like one on the left seems to have the front of a correllian corvette.. and one towards the back could even just be an upside down medical frigate. and the one you can see next to the docked falcon looks like a pair of YT cockpits lashed to some sort of center structure. if that rings any bells for anyone? could be actually, though it seems a little more symmetrical. the overall shape seems consistant, theres still some other ones in that fleet I don't recognize but I feel a little better now that I've got a possible ID for one of them at least.